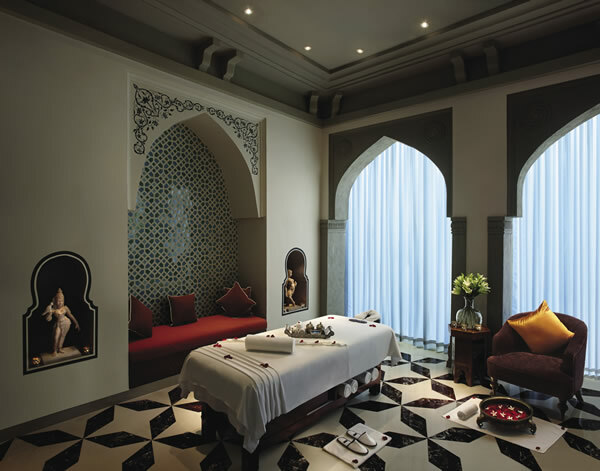 The Willow Stream Spa at the Fairmont Jaipur in India. Contemporary Asia is awash with freshly built, first-rate resorts that consistently raise the bar for the rest of the world—destinations where pampering and lavishness seem routine. This is in line with a study conducted by the International Luxury Travel Market that concluded that well-off tourists generate more than 20 percent of the annual global travel revenue—even though they represent only 3 percent of travelers. In fact, there are so many top-tier properties and destinations in Asia that choosing the perfect one depends entirely on an individual’s preference. From the steamy Indonesian environs to the arid Himalayan highlands, today’s travelers face the delightful choice of picking from an ever-growing menu of luxury accommodations. 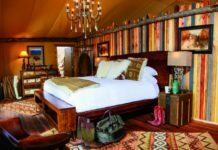 Some hotels are going beyond their traditional sterling services to provide guests with unique ways to enjoy their stay. 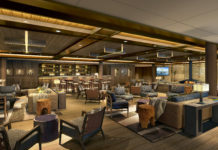 The Peninsula Hotels, the venerable brand known for its exquisitely luxurious flair, for example, relaunched its successful Peninsula Academy program this year. As part of the program, guests receive hands-on instructions on a variety of interests ranging from kite making to performing in a Chinese opera. For example, guests of The Peninsula Hong Kong can opt for the Journeys of Peninsula, a private helicopter adventure that takes them to the beaches of Sai Kung, where they’ll have dinner on a secluded bay. At The Peninsula Shanghai, they can take a trip back in time to Shanghai’s 1930s heyday as part of the Retro Shanghai package. They’ll get tailor-made traditional Chinese outfits and get a private tour of the city’s finest heritage buildings while cruising in the hotel’s Rolls-Royce Phantom limousines. Other top-tier brands stick to more traditional methods, but what remains constant is the luxury that embellishes some of Asia’s elite properties. Here’s a sampling of enthralling sanctuaries. The Datai Langkawi in Malaysia features 14 Beach Villas located just steps from the Andaman Sea. And when it comes to luxury tourism, one of the best bets in the country is The Datai Langkawi, which sits on a numinous island offshore Kedah State—where the Strait of Malacca joins the Indian Ocean, a stone’s throw from the Malaysia-Thailand border on the Andaman Sea. The property is surrounded by dense rainforests and lined with white beaches and sapphire waters. It’s ideal for those who come seeking a nature getaway, to enjoy aquatic sports, or merely to bask in solitude surrounded by luxury. New to the property are 14 Beach Villas located just steps from the Andaman Sea and which range in size from 2,300 sq. ft. for a 1-bedroom villa to the whopping 5,100-sq.-ft., 2-bedroom master villa (from about $3,100 per night dbl). Elegantly appointed, each villa incorporates an open-plan design with raked timber ceilings that allow the sea breeze to flow in freely and there are expansive views of the sea from everywhere in the room. The living areas link effortlessly with a secluded, fully enclosed verdant garden that hosts a rainshower and a 32-ft. private pool. 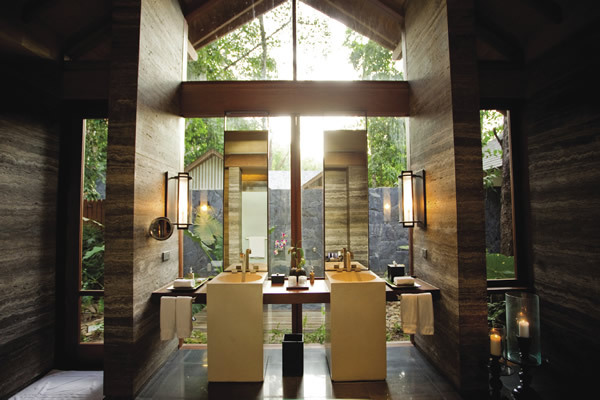 A perfect complement to the luxurious villas is The Spa at the Datai, a Malay jewel hidden under a rainforest canopy. It’s a 4-pavilion facility that includes a selection of Balinese and Malaysian specialties. Golfers, meanwhile, will enjoy the Datai Bay Golf Course, a championship 18-hole challenge designed by Ernie Els that was unveiled in August. Also in Langkawi, the Seri Chenang Resort Villas, a luxury boutique resort that opened this past May, lies isolated from civilization by lush rainforests at the edge of Chenang Beach while the Machinkang mountain range gives it a dramatic backdrop certain to astound. A stay at Seri Chenang will make clients feel as if they were born with the proverbial silver spoon in your mouth. Its six villas and 13 rooms are hidden in a clearing with spectacular views of mountains, rice paddies and the sea, while the accommodations are an exquisite blend of traditional Malay styling brimful with luxurious amenities. Every villa (from approximately $467 per night pp) overlooks the Andaman Sea and each has its own divergent character showcasing the myriad styles of Malay architecture from the county’s various states. The facilities are unparalleled, with an infinity swimming pool, gymnasium, art gallery, luxury boutique and its super elegant Kayangan Spa, with a menu based on therapies drawing on the rituals of Malaysia’s age-old ancestry. The spa is hidden in the middle of a series of limestone cliffs and consists of a number of thatched pavilions with individual rainshowers and floor-to-ceiling windows. And when pampering of this caliber isn’t enough, Seri Chenang offers 24-hour private butlers from the moment guests arrive until they check out. If pampering of this caliber gets a little old, the resort has a wide range of options, including scuba diving or chauffeured treks to the surrounding countryside. And however far-off the location may seem, it’s actually not difficult to reach: Silk Air and Malaysia Airlines offer regular, 40-minute flights from Kuala Lumpur, and Cathay Pacific, China Southern and Air Asia have seasonal flights to Langkawi. 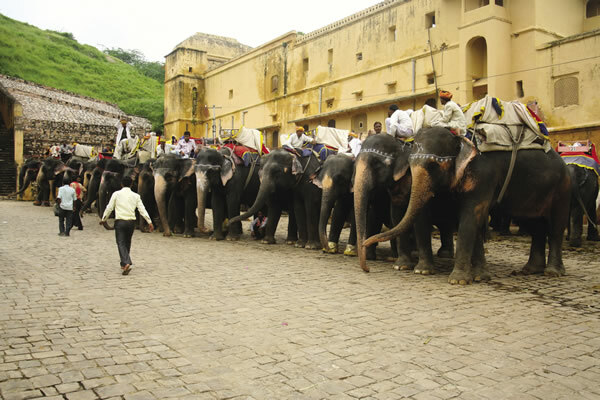 Greaves Tours offers an extensive list of itineraries to India’s myriad destinations. Few destinations capture the spirit of a country as Jaipur, India’s fabled pink city in the state of Rajasthan, known as “The Land of Kings,” where every romantic ideal about the subcontinent comes into focus. Jaipur has gardens, palaces that once were homes to maharajahs, exquisite weather, captivating attractions…and The Fairmont Jaipur, a 255-room luxury marvel that opened last July. Those looking for something far from the ordinary won’t be disappointed. The resort not only offers tours of Jaipur and visits to historical forts and palaces, but also treks into Rajasthan’s rugged terrain, hot air balloon adventures and even picnics on elephant back. The property reflects the majesty of early dynasties and its rooms and suites, with their alluring blend of traditional Rajasthani decor and modern touches, are perfectly suited for honeymoons and romance. Every room (from approximately $250 pp per night dbl) has views of the mountains or gardens, and no stay is complete without sampling the delights offered at Anjum, the hotel’s tea lounge, where one finds a “new dimension” to the art of tasting tea. This is a place that will enthrall tea lovers who get the rare opportunity to sample Adrak Wali Chai, the legendary Indian ginger tea, plus a staggering variety of black and white teas, as well as those infused with herbs like basil, lemongrass and mint. The teas and herbs, incidentally, are all grown on the premises. Zarin, the resort’s restaurant, is considered one of the top in the region and features classical dishes prepared using ancient traditions and rare spices while still retaining a modern flair. The Willow Stream Spa, which recently opened, is a 12-treatment room facility and specializes in traditional Indian treatments in a plush sanctuary. Okinawa, the southernmost region of Japan, has long been relegated as a forgotten destination in the “Land of the Rising Sun.” For years the main island of the Ryukyu island chain was popular almost exclusively with Japanese who came to bask in its tropical atmosphere and who thought of Okinawa as something of a Japanese Hawaii. With its astonishingly clear waters, World Heritage sites, friendly locals and delicious food, Okinawa always had the elements to attract the so-called Louis Vuitton set. Unfortunately, for decades the island chain had a serious lack of luxury hotels, giving it the undeserved reputation of a low-rent destination. That is changing, as discriminating travelers seeking a new and relatively unexplored luxury destination are turning Okinawa into a “hot” place to visit. The island is within easy reach. Nippon Airways and Japan Airlines offer many flights from Tokyo’s Haneda Airport to Naha, Okinawa’s capital. Once there, consider the HOSHINOYA Okinawa, which opened in August 2012 and is located on a majestic natural bay on Taketomi, a speck of an island easily accessible by ferry from Naha where luxury, style and traditional Japanese atmosphere are ladled in an implausible tropical setting. The 48-villa Hoshinoya Okinawa, a member of the resort-hotel conglomerate that owns the legendary HOSHINOYA Karuizawa and the HOSHINOYA Kyoto, is shaking things up in Okinawa by offering what Yoshiharo Hoshino, the company’s president, calls “authentic Japan with modern comfort.” Care has been given to pattern the property after ancient Okinawan lines; even the 150-ft. long swimming pool is designed to resemble a traditional village well. The property’s villas (starting at approximately $680 per night) come in diverse categories and really play up the Japanese aesthetic with open-style living rooms, free-standing bathtubs in airy bathrooms, and futons on platforms in tatami bedrooms. Suites are suitable for couples and families. The resort’s restaurant highlights the same cuisine that is credited with Okinawans claiming the world’s longest lifespan—islanders average more than 80 years—and is thus heavy on seafood, greens and fruit. The French-trained Japanese chef produces dishes that change daily and include Ryukyu touches to memorable treats like imperial prawn ceviche and ishigaki beef with local-herbed bearnaise. The library lounge is full of literary treasures, and there is an adjacent shop selling rare local arts and crafts. Visitors to the sparkling resort rave about the plush 5-room spa where a 20-minute soak in a hinoki wood tub following a traditional Ryukyan treatment will soothe body and spirit. There’s also myriad tours and activities, including snorkeling, scuba diving, cruises, sunset tours and excursions to neighboring islands, as well as access to three private beaches. In-room villa dining at Montigo Resorts Nongsa in Indonesia. It’s nearly impossible to discuss luxury accommodations in Asia without a mention of Raffles, the legendary grand dame of hotels that began in 1887 in Singapore when the great city was a backwater port at the tip of the Malaysian Peninsula. Raffles was the Singapore hotel of choice for luminaries like Rudyard Kipling, Somerset Maugham, Queen Elizabeth, Joseph Conrad and Ernest Hemingway. Today, Raffles heads a collection of 10 memorable hotels and last month added Raffles Hainan—its second China property after the already legendary Raffles Beijing—on Hainan Island’s Clearwater Bay. The location of this new hotel fits the brand to a tee. After all, Hainan is a lush tropical wonderland in the South China Sea with an extensive pedigree as a vacation area that has earned it the reputation as being China’s answer to the French Riviera. Hainan is one of the “hottest” spots on China’s southeast coast. The island has a wide range of activities including diving, surfing, parasailing and the chance to explore quiet villages. Getting to Hainan is easy. Airlines, including China Eastern, Cathay Pacific, Hong Kong Airlines and Hainan Airlines, have direct flights from Hong Kong. More adventurous travelers may opt to take a train to the island; this is a singular experience where passengers remain on the train while it’s loaded onto a gigantic ferry for the 1-hour ocean crossing to the island. China Rail has daily service from Shanghai or Hong Kong. Although fares vary depending on the day of the week, prices average about $180 pp. Herbert Laubichler-Pichler, general manager of Raffles Hainan, says that the locale is a natural for the celebrated hotel collection. “Raffles Hainan is one of the most prestigious addresses on China’s popular holiday island,” he adds. “It is the first luxury opening on Clearwater Bay, the only resort adjoining championship golf courses. Its large guestrooms all feature seaview balconies. With the addition [of this resort] we are setting a new luxury benchmark on the island.” Luxury indeed. Its 299 rooms, including suites (measuring an average of approximately 800 sq. ft.) and 32 villas are a blend of contemporary with local accents. There are wood furnishings carved by local artisans that look like they were filched from museums. Colorful fabrics draped around the guestrooms pay homage to traditional Hainan tribes, while modern amenities make guests feel like they will never want to check out. Guests are going to want to go for cocktails at the Long Bar, a tribute to the bar at Raffles Singapore where the world-famous Singapore sling was created; dine in at the varied restaurants that offer everything from Chinese to Mediterranean cuisine; and indulge at the 15,069-sq.-ft. Raffles Spa, which features eight individual villas and two private spa suites. Accommodation rates vary depending on season, but generally run from approximately $500 to $750 pp per night. When it comes to tourism, Myanmar is ready for its close-up. It only takes a few hours there to understand what the hype is all about—and the travel industry is sitting up and taking notice. For years considered a backwater stop because of its self-imposed isolation and political turmoil, Myanmar is hogging the tourism spotlight. Abercrombie & Kent saw a 90 percent spike in the number of tourists to the country; Indochina Travel claims that its Myanmar tours have risen from 15 to 35 percent in the past year alone. It wouldn’t be an overstatement to say that Myanmar’s rise in tourism has been meteoric. According to a report by the country’s Ministry of Hotels and Tourism, tourism grew by a whopping 30 percent—Southeast Asia’s largest—surpassing Thailand and Vietnam. When French designer Brigitte Dumont de Chassart received the commission to design Bagan Lodge, Myanmar’s newest and most modern boutique resort that had a soft opening in August in Bagan, she faced a tall order. The 85-room lodge was to be built on a tract adjacent to the boundaries of the Bagan Archaeological Zone, about 180 miles southwest of Mandalay, where more than 2,200 tiered brick temples—some dating back a millennium—stand in the 17-sq.-mile Bagan archaeological zone, a sector considered to hold the largest concentration of Buddhist monuments in the world. “Of all of the country’s many cultural attractions, Bagan stands out as the ultimate Myanmar experience,” Bagan Lodge’s general manager, Shane McKirdy, says. De Chassart’s task was to intermingle traditional Burmese designs that pay homage to the region’s rich culture while at the same time reflecting British colonial-era grandeur with the contemporary touches discriminating modern travelers demand. Bagan Lodge is a sparkler with three classes of accommodations ranging from spacious deluxe rooms measuring more than 500 sq. ft. to the Queen Victoria Suite—four bedrooms, private garden and living room—at more than 2,100 sq. ft.
Each of the guestrooms (rates start at approximately $180 pp per night, dbl) is patterned after traditional Burmese designs, with simple rattan chairs and rich mahogany furniture. Its open-air Tiffin Box Restaurant serves first-class local dishes. The spa has eight treatment rooms where novel treatments are the norm. Guests have the option of going on a private pagoda tour or go on fishing trips on the banks of the Irrawaddy River. If the old axiom that location is everything, then Montigo Resorts Nongsa, on Batam, a tiny tropical island about 30 minutes by ferry from sparkling Singapore, has it made. Its unparalleled elegance and excellent services make it an ideal, luxurious retreat from where to explore a vibrant city that’s no slouch when it comes to first-rate properties. Even the most cultivated and refined traveler will delight in Montigo Resorts Nongsa, a member of the Boutique brand of the Preferred Hotel Group that opened in mid-2012. Montigo Resorts Nongsa’s appeal to luxury travelers comes from its intimate setting, promise of exclusivity, beautiful villas, and six international golf courses. 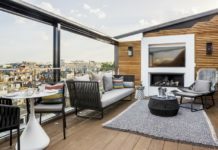 The views from its rooftop terraces are stupendous and it often seems implausible that such a peaceful property exists so near one of the world’s great city-states. 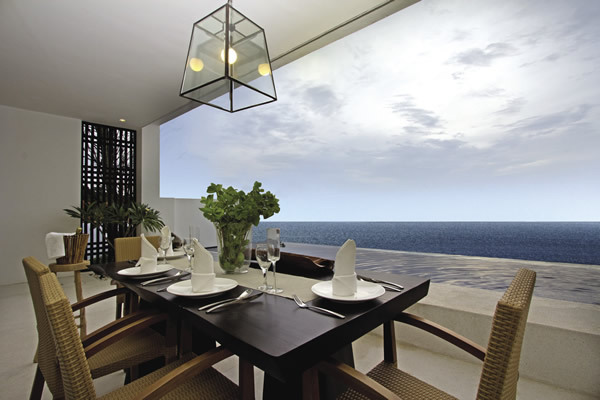 The property overlooks the South China Sea and has 88 three-level villas that weigh in at 3,300 sq. ft. with floor-to-ceiling windows overlooking the water. 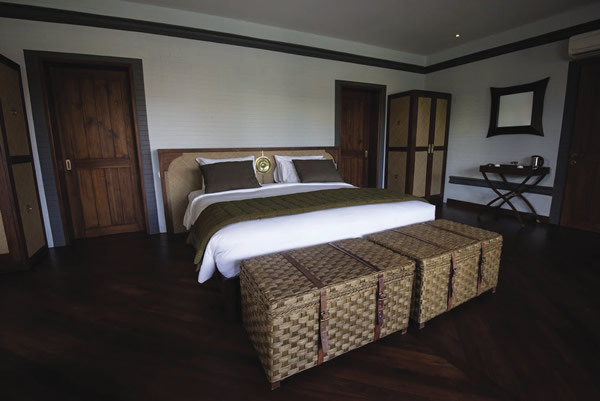 Each villa has top-of-the-line furnishings with soft Indonesian touches. A personal concierge attends to every guest need and attentive yet unobtrusive service seems to be the order of the day. Guests have the option of villas on the hilltop, hillside, beachfront, or near the spa (from approximately $350 pp dbl). While the cuisine prepared in its restaurants is highly rated, the spa, adjacent to the beach, offers the best treatments and relaxation therapies. Touring Asia in luxury is one of the more unforgettable experiences for travelers. The sites, cities, richness and the continent’s striking characteristics alone will form indelible memories for years to come—and if done in style, comfort and lavishness, few experiences can hold a candle to such trips. One of the company’s newest trips to India is the 10-day Contemporary India – A World of Art. Travelers will meet with experts to discuss artists, examine new pieces, and get a full introduction to how Indian art has changed over the years, from original miniature paintings to today’s contemporary masterpieces. Highlights of the art journey, which takes travelers to Delhi, Agra, Jaipur and Mumbai, include a visit to the Kiran Nadar Museum of Art in Delhi; a day with an art expert who will trace the historical development and evolution of the various schools of modern Indian art while travelers tour prominent art galleries in New Delhi; an afternoon in Jaipur with a master artist of miniature paintings to learn about this incredible example of Rajasthani art; and specialist guided visits to explore works of internationally renowned artists in Mumbai. Priced from $5,577 pp dbl.